Summary: Americans have been subjected to barrage of propaganda about global warming of a length and intensity never seen in this nation except during wars. That it has failed so far (see polls here) seems remarkable (explanations vary). Instead of reflecting on this failure, finding lessons learned, the Left has elected to double down: betting their credibility on increasingly extreme forecasts — a combination of misrepresentation of climate science and disregard of that consensus. Today we look at a fun but mad example, an article that’s set Twitter aflame with ignorant fury. In 2013, however, the ocean gained the heat equivalent to about 12 bombs per second, says Science Skeptic. 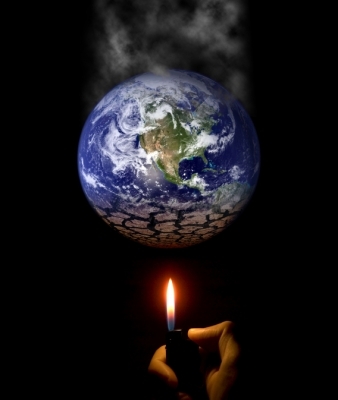 That adds up to more than 378 million atomic bombs a year worth of heat. That’s troublesome, considering that warmer waters are thought to make hurricanes and typhoons more severe, including Typhoon Haiyan, which ravaged the Philippines in 2013. Warmer waters also cause global sea levels to rise, threatening property values and exacerbating flooding. This is idiotic, even for climate propaganda. After you change your pants, consider two facts. 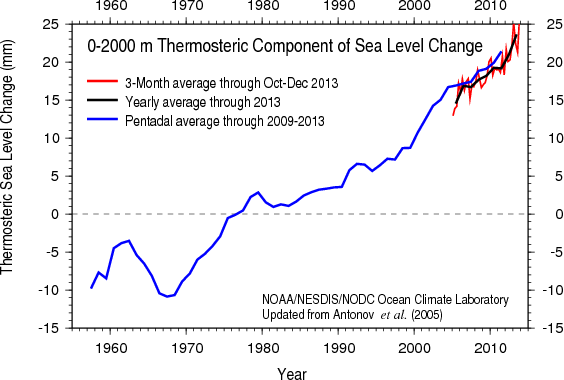 (a) The total thermosteric change in sea level since 1970 is 1.4 inches, from that graph. Not exactly flooding the continents, like in “The Day After Tomorrow”. The IPCC estimates that the seas rose at roughly 0.7″/decade from 1901 – 2010 (including the thermosteric rise; see AR5 3.7.2). This rate will increase if warming increases as they project. (b) As for the warming oceans, see the Figure 3.3 below from the IPCC’s new AR5, chapter 3 — the “gold standard” for determining the consensus of climate scientists (large PDF here). It shows warming of roughly 0.1°F per decade (see the ARGO website). To call this “cooking the oceans” is an exaggeration that would make Goebbels proud. Expressing the warming in joules nicely confuses the lay reader. Figure 3.3 (a) — Areal mean warming rates (ºC per decade) versus depth (thick lines) with 5 to 95% confidence limits (shading), both global (orange) and south of the Sub-Antarctic Front (purple), centred on 1992–2005. Global sampling of the ocean below 2000 m is limited to a number of repeat oceanographic transects, many occupied only in the last few decades (Figure 3.3b), and several time-series stations, some of which extend over decades. This sparse sampling in space and time makes assessment of global deep ocean heat content variability less certain than that for the upper ocean, especially at mid-depths, where vertical gradients are still sufficiently large for transient variations (ocean eddies, internal waves, and internal tides) to alias estimates made from sparse data sets. Comparison of an atomic bomb to a event at a point (e.g., volcano, meteor impact) makes sense. 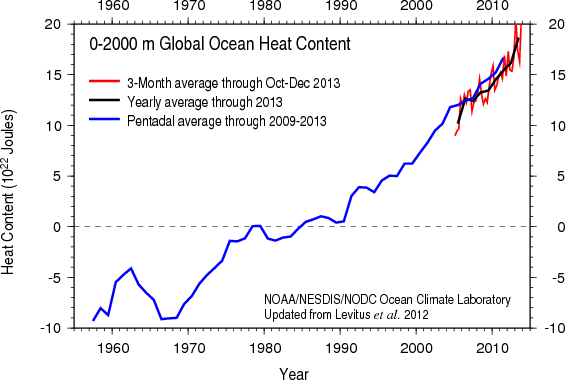 Well, Lubos Motl has done the arithmetic in this post Ocean heat content: relentless but negligible. This is a good post, check it out. The punchline of his calculations: the heating in the layer 0-2000 m translates to 0.065 C +/- 20%. His calculations are essentially confirmed from this ARGO page where they confirm that since the 1960s, the warming of that layer was 0.06 °C. So, can anyone figure out why 0.06C is a big deal for the climate? Or how all that heat that is apparently well mixed in the ocean could somehow get into the atmosphere and influence weather/temperatures/rainfall on the land? Or is sequestering heat in the ocean a fortuitous ‘solution’ to the global (surface) warming problem? Since AR4, estimates of both the thermosteric component and mass component of GMSL rise have improved, although estimates of the mass component are possible only since the start of the GRACE measurements in 2002. … Although still a short record, more numerous, better distributed, and higher quality profile measurements from the Argo program are now being used to estimate the steric component for the upper 700 m as well as for the upper 2000 m. However, these data have been shown to be best suited for global analyses after 2005 owing to a combination of interannual variability and large biases when using data before 2005 owing to sparser sampling. Also: the focus on climate change has diverted resources from other vital programs, such as protecting the oceans from pollution and overfishing. The Left has placed all its chips on climate change. Use the contact form, or email to Editor at FabiusMaximus.com (note the spam-protected format). Those of general interest will be posted (anonymously on requested).